The product to create the ultimate matt defined look with maximum texture! The hard-hold clay becomes session-workable in the hands and smoothes away frizziness to provide a long lasting hold with a dry finish. 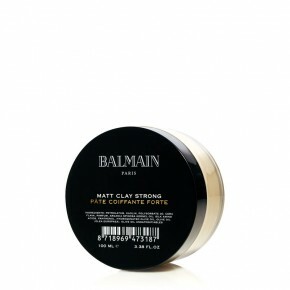 Invigorated with the signature Balmain fragrance, this strong hold clay is a musthave for both fashionable men and women! This magical product is the ultimate hair clay! It has a matte finish and creates a fashionable, long-lasting, natural look in just seconds. It tames tough hair to style the most difficult hair types. The product to create the ultimate matt defined look with maximum texture! The hard-hold clay becomes session-workable in the hands and smoothes away frizziness to provide a long lasting hold with a dry finish. Invigorated with the signature Balmain fragrance, this Matt Clay Strong is a musthave for both fashionable men and women! The ingredients Silk Protein and Argan Oil stimulate optimal moisture retention within the hair cell. They repair and protect damaged, dry and weak hair from environmental extremes. Use: Rub between hands and apply to dry or damp hair. Style as desired. Backstage secret: Combine with the Session Spray Strong for ultimate hold. Ingredients: Petrolatum, Kaolin, Polysorbate 20, Cera Flava, Parfum, Argania Spinosa Kernel Oil, Silk Amino Acids, Panthenol, Hydrogenated Olive Oil, Olive Oil (Olea Europaea), Olive Oil Unsaponifiables.